TWO DAYS AGO we received a piece of mail that made our hearts sink into our stomachs. Why? It was from ReconTrust. Remember them? They’re the ones that sent us a million foreclosure notices. Here. First of all, what kind of name is that? ReconTrust? Really? It’s suspicious to begin with. It sort of sounds like “We can trust” which makes me think, “No. No, no. We cannot trust ReconTrust.” Or reconnaissance. Which is “a military term denoting the exploration used to gain information.” So that makes me think we’re being spied on by a company that feels the need to put the word ‘trust’ in their name. But seriously, what is the origin of this name? Perhaps it comes from the FDIC’s “Regional Economic Conditions” (RECON). But that doesn’t quite fit. Well, regardless the name alone still incites shivers, stomach flip flops and light-headedness. So what was it this time? 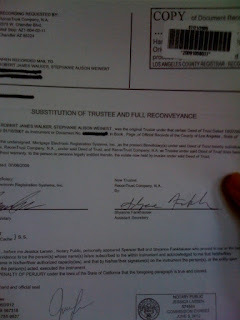 It was an official notarized document called SUBSTITUTION OF TRUSTEE AND FULL RECONVEYANCE. Ah, yes… the Substitution of Trustee and Full Reconveyance. Of course. Not really. We had no idea what this was. But we assumed it meant bad news. Because anything from ReconTrust has been bad news. Does this mean that National City is coming after us? 1. To transfer back to a former owner; as, to reconvey an estate. Oh. Well, that sounds… like good news. Right? Perhaps? I mean, we wouldn’t have been able to have sold the house had their still been a lien. So this is really just a formality, it seems. When a home loan is paid off, a Lien Release is recorded with the county. A lien release document transfers title from a trustee or beneficiary (e.g., the lender) to the equitable owner (e.g., the borrower) of the real estate when the debt is satisfied (or paid off) under the terms of a deed of trust or mortgage. Every state uses a different name for the Lien Release Document, e.g., Satisfaction, Release, Discharge, or Substitution of Trustee and Full Reconveyance. No matter what it’s called, the lien release document has the same purpose: to release the lien of public record. So, it is good news I suppose. It is a lien release document. But seriously, every state has a different name for it? Why? To keep us on our toes? Does this mean that National City isn’t going to try to collect on the difference? That the debt is satisfied? I don’t know. We were told that they are waiting up to three years after a short sale to go after the difference. But that’s another story. For now, we’d just be happy to never receive another piece of mail from ReconTrust ever again. Let’s hope this is the last. I like happy mail. What about you? What is the best piece of mail you’ve received lately?